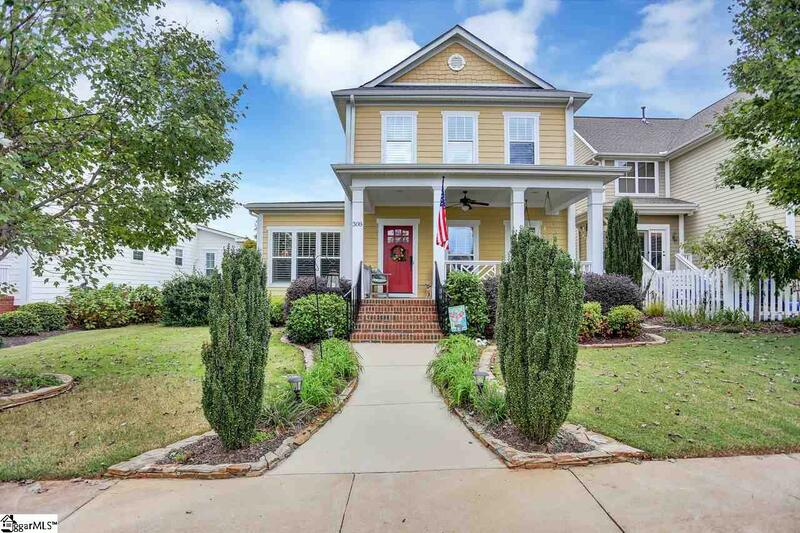 Custom Craftsman style home with low maintenance yard across the street from the large central park. The Owners suite is on the main level; beautiful coffered ceiling, stained and patterned glass window with built-in book shelves and a large custom designed closet with shelves, chest of drawers and hidden ironing board. Master bath features double vanities, garden tub with decorative window and separate tiled shower. Great room has custom shelving, gas logs in fireplace and surround sound speakers. Dining room with coffered ceiling and hanging tiffany lamp. First level with hardwood floors in all rooms except sunroom, laundry and baths which have ceramic tile. Kitchen has recessed lighting under the cabinets with granite tops. Large kitchen island with seating for two. Kitchen also has a pantry and breakfast area. Bathrooms throughout also feature granite counter tops. The upstairs landing and one bedroom have hardwood; ceramic tile in bathrooms and carpet in two bedrooms. Each bedroom has a large walk-in closet. There are also two other large closets with double doors. Largest bedroom/bonus room has access door to attic space. The house is pre-wired for security and is plumbed for central vac. Garage is oversized. Plantation Shutters and custom shades on first level will remain. Professionally landscaped yard with stacked stone features. New AC unit installed downstairs in 2017.